First you'll need to download the OziExplorer program from http://www.oziexplorer.com/ . The shareware version will work fine for what we're doing, but if you like you can get the full featured version for $75.00 US. OziExplorer shareware version will only work with bitmap format files, while the full version will work with many file types. You'll need a GPS that can record tracks and be interfaced with a computer. Almost any GPS unit sold today will suffice. Since I have a Garmin GPS 12 (~$150.00), that's what we'll talk about today. (Best GPS info page is here) You'll need a GPS to computer interface cable, available from the GPS manufacturer or build one yourself with sharehardware connectors from Larry. Next you'll need a map of the area you'll be flying, in bitmap form. 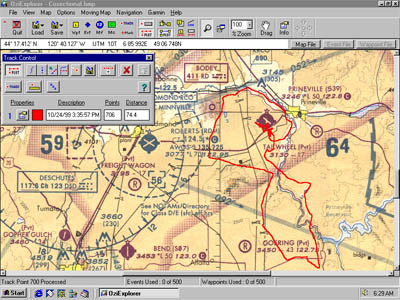 You can scan a map or sectional chart or you can purchase topo maps on CD from DeLorme at http://delorme.com/, or from other places linked from this GPS info page. Follow the OxiExplorer instructions to load and calibrate the map, then save it to your maps file. The next chore is the most fun. Set your GPS to record a track of your flight, then go fly. Don't forget to stop recording after you land or you'll record the drive home. See your GPS manual for details on recording a track. When you get back home, plug the GPS into the computer and start OxiExplorer. Load the calibrated map file you saved previously, then download the track from your GPS. The track will be displayed on the map with amazing accuracy, showing details down to the "S" turns you made to slow down and wait for your slower friends. Once you have the track and map displayed on the OxiExplorer screen you'll be able to zoom in and out, display the total miles flown, save your track, and manipulate the file in many ways. By saving the track with the date, you'll be able to go back and look it up, or even upload it to your GPS so you can repeat the flight.